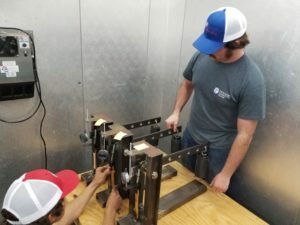 Two Louisiana Tech University College of Engineering and Science students earned the North American Society of Trenchless Technology (NASTT) Michael E. Argent Memorial Scholarship. John Kraft, master’s degree student in engineering with a concentration in civil engineering, and Jeb Kraft, senior construction engineering technology student, received the award for research and student leadership in trenchless technology. John and Jeb Kraft work on a project to measure long-term tensile creep data. Dr. John Matthews, associate professor of civil engineering and construction engineering technology at Louisiana Tech and director of the Trenchless Technology Center, says that he is pleased that John and Jeb Kraft received the honors. In addition to being in NASTT/AGC and ASCE, John Kraft is also a member of the Society of Automotive Engineers Baja Team. The NASTT established the scholarship in honor of founding member and trenchless technology authority Michael E. Argent to inspire young trenchless technology professionals. The scholarship provides a $5,000 stipend to fivestudents each year. Awardees must be enrolled as full-time students in accredited colleges, universities or trade schools for the year of the award. John and Jeb Kraft will be formally recognized in a special awards presentation during the NASTT 2019 No-Dig Show, which will be held in Chicago, Illinois, in March.